Rome - It may seem clichè to say that the center of the Christian world is one of the best places to experience Christmas but believe me, it lives up to the hype. Rome goes all out when it comes to Christmas but in a good way. Nativity scenes in every church, beautiful trees in front of Saint Peter's and the Colosseum, a bustling Christmas market in the Piazza Navona and fabulous shop windows all beautifully decorated. There is definitely a festive feel in the air and when every bar has towering stacks of panettone and pandoro, what could be bad? There are special concerts and events throughout the season and a highlight to me is Christmas Eve mass in the Pantheon complete with Gregorian Chant. That is truly the magic of the season. Gubbio - According to the Guinness Book of World Records, Gubbio has the largest Christmas tree in the world. Built on the slopes of Mount Ingino, it stands 650 meters high and is topped with a 1 square meter star that is made up of over 300 lights. The tree is illuminated nightly from the eve of the Immaculate Conception (December 7) to Epiphany (January 6) and this year the honor of the first lighting went to Pope Francis. Gubbio is a beautiful town in Umbria that is worth a visit and if you go at Christmas time, make sure you stay until dusk to see the tree. Armenzano or Petrignano - also in Umbria are two hamlets which both create a living nativity each year. To me, the living nativity is the most beautiful Christmas tradition. The first living nativity was created by Saint Francis of Assisi and took place in Umbria in the 13th century. 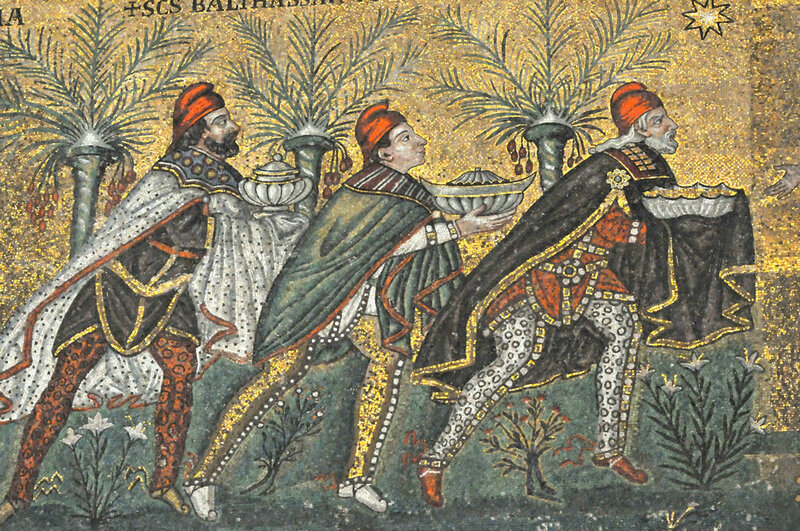 The tradition is strong in this small region known as the Green Heart of Italy and there are numerous villages that hold their own event from Christmas Day until the arrival of the Three Kings on January 6. I have fond memories of Christmas spent in Assisi and Christmas night spent both in Armenian and Petrignano. The Petrignano presepe is bigger as is the town but there is something very special about the Armenzano. The pathways are lit by torches and you make your way through the town of Bethlehem while sipping mulled wine from terra cotta cups and taking in the spirit of the tradition. 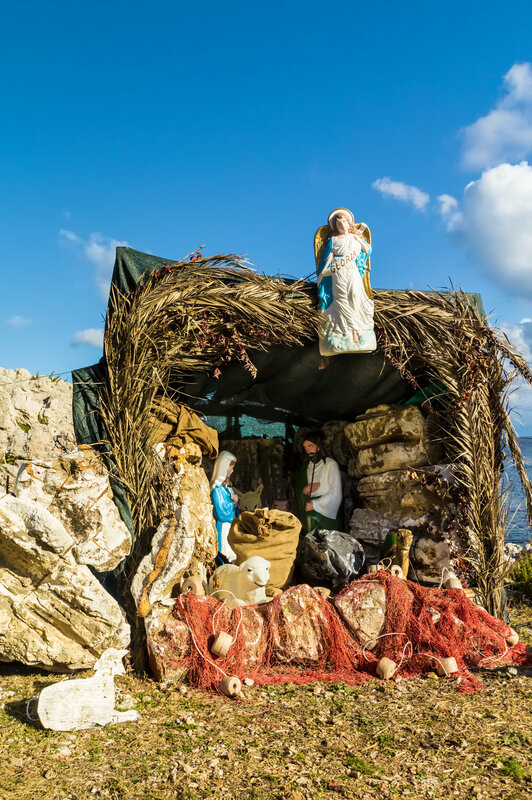 Naples - There is no better place to shop for your Nativity scene that the city of Naples. Head to Via San Gregorio Armeno (aka Naples' Christmas Alley) where you will find shop after shop dedicated exclusively to the figurines for your nativity. Of course there will be Mary, Joseph, the Baby and the Three Kings, but don't forget the pizza maker (this is Naples after all) as well as today's politicians and soccer stars. Everyone seems to have been present at the birth of Christ. And if that isn't enough to tempt you, where better to dine on the Feast of the Seven Fishes than overlooking the Bay of Naples?? L'Albereta - If your idea of celebrating means embracing the peace and calm of the season, then a stay at the luxurious L'Albereta hotel should be your holiday destination next year. This magnificent Relais & Chateax property pulls out all the stops: your room will be decorated in the holiday color scheme of your choice (red, gold or white), Santa stops in Franciacorta for a visit in the living room on Christmas Eve, attend mass at the church of Madonna della Neve, take part in a cooking class where you learn to make traditional tortellini in brodo (a must for any Italian Christmas table). This and so much more as you are pampered and spoiled for a long weekend. Merry Christmas indeed. You can find more details about the seasonal celebration on the L'Albereta website. All this talk has me ready to hop on the next plane... we could make it there in time to hit all six of these places - no sleigh required. Who's with me?? Need Help for a Stress Free Holiday? L'Esperta Can Help! Please don’t shoot the messenger….. but Christmas is 48 days away. I know it is not what any of us wants to hear. No matter how much we love the season, there is an element of chaos and stress that needs to be put off for as long as possible. Although, putting off the inevitable for too long leads to even more of that chaos and stress. After 13 years of marriage, my husband has finally resigned himself to the fact that living with me for the three weeks leading up to Christmas are….ummm…. trying (to say the least). I love Christmas and I am relatively organized when it comes to the shopping and wrapping. Gone are the days when I used to make my own gift tags and wrapping paper – I now slap a sticker on those boxes like it’s nobody’s business. See Doug, I am letting go…. a little. But then there is the baking. Somehow for me, every person who I have come in contact with in the past 365 days deserves baked goods from the L’Esperta Kitchen: the mailman, the garbage men, the pet sitter, the riding instructor, the barista at Starbucks. In this day and age of rushing and prepackaged everything, I love the process of baking. I turn on my Christmas music and spend the afternoon lost in my thoughts and mountains of sugar and butter. It’s not a bad way to spend a day. This year however, as a gift to poor Doug (who is probably the only person not allowed to eat the cookies as they are destined for other houses – and by the time I am done with all the gift giving, I am lucky if I can come up with a few leftovers for Santa) I have a list and a plan. I know exactly to whom the cookies are going and have chosen 12 different kinds of cookies to grace the platters that I will deliver. Would you like to join me? Then sign up below for the 12 Days of Italian Christmas Cookie Newsletter. Every day, beginning on December 1st I will deliver a traditional Italian cookie recipe to your inbox. Believe me, the lineup is great and there is something for everyone. From very traditional to classics with a twist, this is a great way to change up your repertoire. I will also provide hints and suggestions for presentation and packaging. It’s a fun and delicious way to celebrate the holidays AND cross some hard to shop for folks off your list. Let’s face it. It’s a crazy time of year. Parties, cards, gifts, holiday concerts, baking, packing, mailing gifts, moving the damn Elf on the Shelf. Things are downright insane. It’s a shame really because what I want to do every year is slow it all down and really enjoy the season. Unfortunately, according to my husband, I am afflicted with the Jenga disease. You know the game Jenga, where you stack wooden blocks higher and higher until the entire thing collapses? I am the Jenga game when it comes to the holidays. The presepe or nativity scene made its first appearance in 1223 in the tiny village of Grecio in Umbria when it is said that Saint Francis wanted to depict the scene ofJesus’ birth to the towns people and from that time on, the nativity scene has been an integral part of the Italian Christmas tradition. The elaborate models, some life size and some in miniature, are erected on the Feast of the Immaculate Conception (December 8). On Christmas Eve the baby Jesus is added to the display and finally on Epiphany (January 6) you will witness the “arrival” of the Three Kings. The detail and beauty of these crèche scenes are remarkable. You can see them in the piazza and inside churches, often indicated by a shooting star placed over the door inviting you to come in. The scenes have waterfalls, moving parts, nods to modern culture (I saw one with an Obama figurine this year) and twinkling stars lighting up the sky. One can’t help but be moved. The most remarkable of all the nativity scenes I have witnessed over my years in Italy was the living nativity that I went to on a windy and cold Christmas Eve. From Assisi we made our way to Armezano, another little hilltown which for the time being had been transformed into the town of Bethlehem. With our hands wrapped around terra cotta cups of hot mulled wine we made our way through the village. There were sheep and goats milling about, big torches lit the way and every member of the town was dressed in period costume. We walked through town and were drawn into the stable where Mary, Joseph and Baby Jesus sat on the ground with only a pile of hay as cushioning. There was a warm glow in the barn and a sense of peace and love that I found almost miraculous. Merry Christmas indeed. Foodie Friday: Hooray! It's Pandoro Season! The holiday season is upon us. There is nothing more comforting to me than the traditions that come with this time of year. Call me boring, a stick in the mud, a conformist but I remain loyal to the classics: mistletoe, O Come All Ye Faithful, peppermint stick ice cream, beef tenderloin for Christmas dinner. Naturally, the Italians have their own traditions and it was delightful to spend the holidays in another country and experience a whole new way of celebrating. There are many beautiful traditions in Italy - the creche, magnificent store windows, living nativity scenes throughout the countryside and all sorts of culinary delights. As the weather turns cold, I find myself waxing nostalgic for the most telling sign of the arrival of the Christmas season: pandoro and panettone. These buttery Christmas cakes come in gorgeous cardboard boxes and wrappings and can be found in any food shop or bar in Italy from the beginning of December on. Panettone is studded with candied fruit while pandoro is a plain cake dusted with powdered sugar. When I studied in Florence, I arrived at my host family's house in the middle of January. There was a tower of panettone and pandoro boxes stacked in the corner of the kitchen. Apparently these Christmas cakes are the Italian answer to a housewarming gift and my family had obviously hosted a LOT of holiday parties. We ate a lot of pandoro that first month - breakfast, dessert and snacks - and while I had my fill of them at the time, I still love the buttery, simple flavor with a cup of coffee. You can imagine my delight when I found miniature cakes at my local Italian cafe this week! The pandoro is made in a star shaped pan but if you cut it horizontally, you can make it look like a Christmas tree. I scooped up three of them and made a cute, edible centerpiece that made our kitchen table look very festive. Unfortunately, the centerpiece did not remain on the table very long. It seems that Bella the hound is also a big fan of pandoro. Leave me a comment and let me know how you are incorporating traditions into your celebrations this year.